You are taken to a land far, far away, where you will find the infamous palace, the incredibly beautiful star filled sky, and some known characters – with a somewhat evil twist. The angry pirates, the prowling tiger, and the fierce princess are here to take you on an adventure in this Aladdin-look-a-like game. We present you to Arabian Tales video slot, a game brought to you by Rival Gaming. Rival Gaming first launched in the year 2006 offering several great brands. These brands were designed initially to make the gaming experience as enjoyable as possible for players. After years of research and development from a team, fully loaded with experienced developers, several creative artists, and a small group of visionary entrepreneurs the time had come. Rival Gaming has made a name for itself as a key player in the industry, producing some of the most fun and compelling arrays of online games for players. At Rival Gaming, they offer more than 160 unique games including desktop and mobile. Rival is maybe most known for their i-Slots series of video slots, which are theme based slot games that can be turned into several slot releases to cover an entire story. This unique and thematic approach to developing online casino games is a big hit with players. Slots may also be Rivals´ cornerstone of empire, but that does not mean they do not offer other games. The library of casino games offered by Rival Gaming is vast, and you will find a stunning selection of video poker, Blackjack, and other table games. Some of the games from Rival are 10x Wins, Wishing Cup, Flea Market, Winter Wonders, and Mystic Wolf. Now, we will find out more about the stunning Arabian Tales! The moment you enter the game, you are introduced via an intro. There is the infamous flying carpet, the angry-looking genie with electric powers, the treasure hunting pirate, and the princess. You can see the majestic palace of Agrabah, with the blue domes and the stars above it, and the tiger appears with yellow and glowing eyes. The game clearly has taken its inspiration from Aladdin, the famous Disney movie, but it offers a twist of events and somewhat different characters. The symbols of the game are all made to suit the theme offered, all with vibrant colours and unique designs. The lower valued symbols are the standard card deck symbols, ranging from 9 to Ace. These are all worth between 65 and 150 coins for a symbol combination of 5. The medium valued symbols are then of the magic book, the golden dagger sword, and the flying carpet, all with a worth of between 225 and 600 coins. The two top paying symbols of the game are the fierce princess with a snake around her neck, with a worth of 750 coins, and the pirate-looking prince with the turban and he is worth a staggering 1000 coins. But Rival wouldn’t leave you with just these rewarding symbols, there are, of course, quite a few extra symbols to keep a lookout for a while in the game. You have the bearded king with the golden turban, which is the Jackpot symbol, the magic lamp which is the Wild, the tiger is the Scatter, and the purple Genie is the Free Spins Symbol. These four symbols can all grant you features and high wins; you do not want to miss them! There is no question where Rival took the inspiration for this video slot from. The intro shows the palace of Agrabah, the tiger, and all resembling scenes from the infamous Disney movie, Aladdin. Everything from the graphics and designs to the music, are all similarly styled to the movie, but with their own twist. The characters are all made slightly different, with a more mad and fierce look to them. The game is, however, very well-made, and in the backdrop, you can see the palace and the stars of the night skies. The reels are made transparent to make this pop out even more, and the symbols are all in moving and clear details. It is surely a game that is easy to enjoy from. 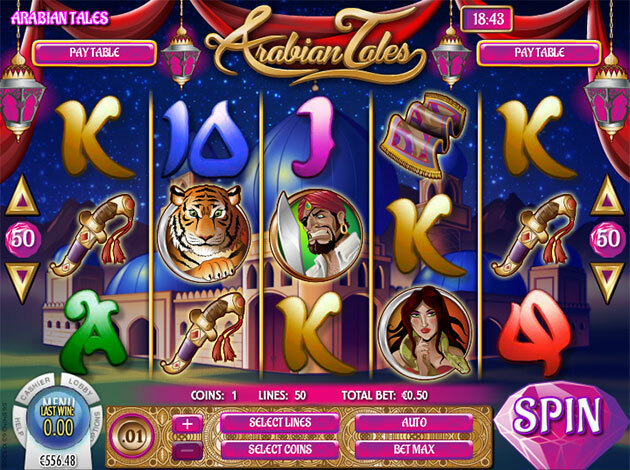 Arabian Tales is a game that is played with 5 reels on 3 rows, and is played on 50 paylines. You can set your bets how you wish, with bets of between 0.01 coins and 0.25, this with a coin value of between 1 and 10. You can also choose how many of the paylines you wish to keep active during gameplay, but the more you choose, the more you can win. Arabian Tales offers a lot of features and extra rewarding symbols, but a Bonus game is not one of them. If you enjoy the fairy-tale and Disney inspired themes with all it has to offer, with an additional Bonus, then you should check out Pinocchio from Betsoft. The game also inspired by one of the most popular animated characters, with a Bonus game that takes you to other worlds with new features and reward in all of them. There is simply a great deal of generosity when triggering the Free Spins of Arabian Tales, with a chance of winning big. Arabian Tales offers a symbol that can grant you the win of a lifetime. The Jackpot symbol is the one of the white-bearded kings, and when landing five of him, you can win a staggering 2.500 coins! The Wild Symbol is the magic lamp, and this steps in with a little magic of its own by granting you Expanding Wilds to fill an entire reel whenever it is possible to create new wins. This symbol also steps in to replace other symbols to grant you wins. The Scatter Symbol is also quite rewarding, as it can grant you wins of between 1 and 50 coins when landing on between x1 and x5 symbols. If you enjoy classic tales, magic, gold, and rewarding features, then this is the game for you. We had a blast trying this game out, and we know for sure that you will too!